I am Susanna Sweeney, a Galway based hypnotherapist. Many of my clients contact me about desired weight loss. Let's face it, there are few people today who don't have issues with weight gain. For many women weight gain starts after they have children. They just cannot seem to drop the 'baby fat'. Bad habits start creeping in when we live busy lives. 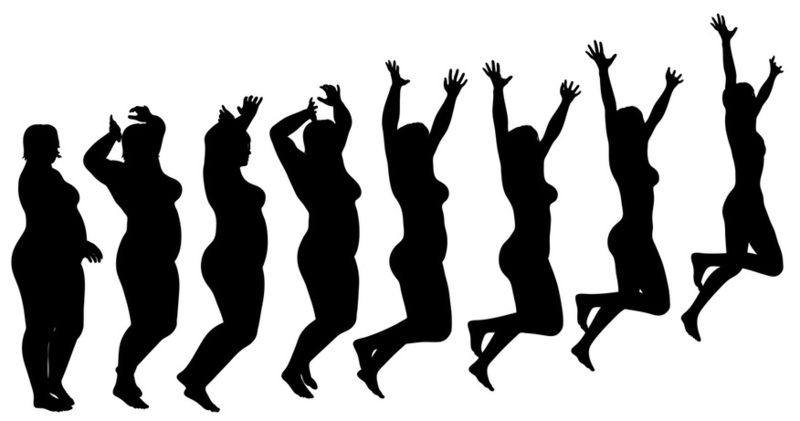 I don't need to spell out to you the disastrous health implications of excess weight. It's really something to address sooner rather than later, however too many have tried and failed with weigh-in based weightloss programmes. Why do they fail? Where standard run of the mill weight loss programs fall down is they forget completely about our subconscious mind. Yet it is this part of our minds that is the most powerful. Our emotions, habits, and desires reside here. And ultimately, emotions, habits and desires will 'run the show' when it comes to the choices we make about our food or drink intake. Standard weight loss programs rely on the use of willpower, however willpower is usually not strong enough to break these powerful habits and emotions in a lasting way. That's why many experience a yo-yo effect, losing weight for a while and then putting it on again. HypnoSlim is a hypnotic weight loss program delivered in a class setting. If you want to lose weight without the usual struggle with willpower then my HypnoSlim classes will be right down your alley way. With the aid of hypnosis you will be able to reprogram your subconscious mind and to develop good habits around exercise and nutrition with ease. With HypnoSlim, change can be easy. HypnoSlim is great value, too. Delivering hypnotic weight loss programs in a class setting makes hypnotherapy very accessible and it is my objective to reach the maximum number of people possible with this fantastic powerful method that has the ability to initiate lasting change. I offer these weight loss classes in Corrandulla. If you'd like to take a class, please submit your details in the form below. Looking forward to hearing from you, Regards, Susanna. What to expect in a HypnoSlim class? I will guide the group into a light trance state which is a very relaxing experience. You have full control over which suggestions you let in and which you don't. While in trance, you will be very alert and your subconscious mind will be very receptive to receiving new ideas and suggestions. The program is designed specifically to support you in your personal weight loss program. The class environment is supportive and non-judgemental with a focus on each participant's goal. At the start of each session, participants will be invited to share how they are getting on, but there is no pressure on people to do so. The best possible nutrition will always be a personal plan. Different foods agree or disagree with different people, and you will be empowered to find out what's best for you. Hypnosis is all about empowering the person to take their life in their own hands. Overall I believe in eating more fresh fruit and most of all veg, and drinking plenty of water. These are very simple and very commonsensical dietary changes to make. These are the choices that I emphasize in the sessions. Exercise however gentle, will greatly improve the body's functioning, and motivation for exercise is included in the programme. So is an awareness around the effects of alcohol on weight and overall health. What does the program NOT do? I don't sell any weight loss products because I don't believe in them. I believe in the power of your subconscious mind. This part of you holds you inner wisdom and once the old patterns are broken it will guide you to the best possible nutrition for you. Hypnosis has nothing to do with mind control, or being out of control. You will be fully alert throughout the sessions and you always have the choice which suggestions to accept and which ones to ignore. Hypnosis sessions have nothing to do with sleep. Many people think they will be asleep- you won't be, in fact you will be much more alert than you are in everyday life. Therefore, it is easy to come back to ordinary reality at the end and we do that very gently, giving you time to adjust and come back to a changed, brand new reality at the end of each session. Some people may feel that there are emotional issues from childhood underlying the weight issue. As I cannot clear up those issues in a class setting, you can do this work in individual sessions with me, for which, as a class participant, you can avail of a 10 percent discount. Always make sure that all of you is on board with your plan of change, in this case with losing weight. For starters, do attend as many of the sessions as you possible can. Also, start taking some action, however small, even before the class, using your willpower and conscious mind to make small steps every day towards improved nutrition. Start drinking more water and eating more veg. This will set you up for a great start. What if the class is not enough? Some people might feel that there are underlying emotional reasons behind their weight gain. For example, a crucial life event or even trauma in childhood might have triggered the eating habit. In that case, it would probably be a good idea to resolve these underlying emotional causes which are driving the habit. This can only be done in one to one sessions as it involves regression work. 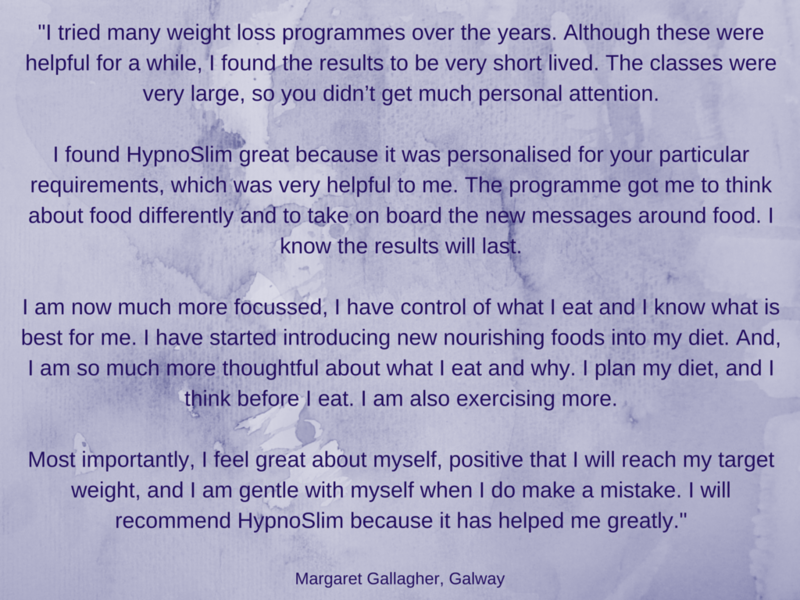 The good news is that as a HypnoSlim weight loss class participant in Galway you are automatically entitled to a ten percent discount on individual sessions with me should you wish to avail of them. ​I find that those clients who do take up individual sessions, make tremendous progress on the programme. Always think of yourself as a piece of work in progress. You are never a finished product. You never have to put up with being unhappy or unfulfilled. Everything is possible and in your power! There is room for infinite improvement. You can become who you want to be. And if you'd like some assistance getting there, I am here to help. Clinical Hypnotherapist and Accredited Psychotherapist MBACP.